Green is a lively color, and it symbolizes renewal and growth. It is the color you see the most in the natural environment. So it is the color of spring, when everything comes to life. And it depicts the period when everything is alive and unrolling its natural processes. When you see something green you know it is alive, right? It also means balance, calm and harmony. So it is a great color to have around when you are trying to restart yourself after a hard day. It is the reason we feel so great when we are out in the open. We feel recharged and calm at the same time, filled with positive energy. It is the power of green, which manages to resonate without inner energy, rebalancing us. In chromatic therapy, green is used to sooth the soul and mind. It helps loosen the body, from a mental and physical point of view. It is an excellent remedy for states of anxiety and nervousness, helping a person to regain his emotional balance and inner calm. In crystal therapy, gems with a green color, like jade or malachite, are used to even out the energies around the emotional center of a being. In Indian believes green represents the Chakra of the chest, where we find the heart, lungs, and circulatory system. These are the part most affected when we are angry, upset or anxious. So the energies coming from this color are used to restore the normal state of the organism and mind. If you want to make a retreat in your home, where you can relax and refresh yourself, decorate that room or corner with green color. But try doing it with more raw shades of green, similar to the ones you see out in the nature. Green tones that are slimier tend to bring negative energies. Just like anything else in this world, colors two have their duality. So make sure you surround yourself by the right color if you want to have the best available effect. A person who likes the green color will always be a lovable and nurturing individual. The positive vibe given by the color will make him protect anything that is alive. He will also have a natural state of balance, with qualities of good observer, listener and counselor in hard times. This person will be a loving parent for his children and have a beautiful home, surrounded by a charming garden and pets. The calm within will always help him take the best decisions, having a well-developed sense of right and wrong. The color can also give people a more negative and extreme characteristics. 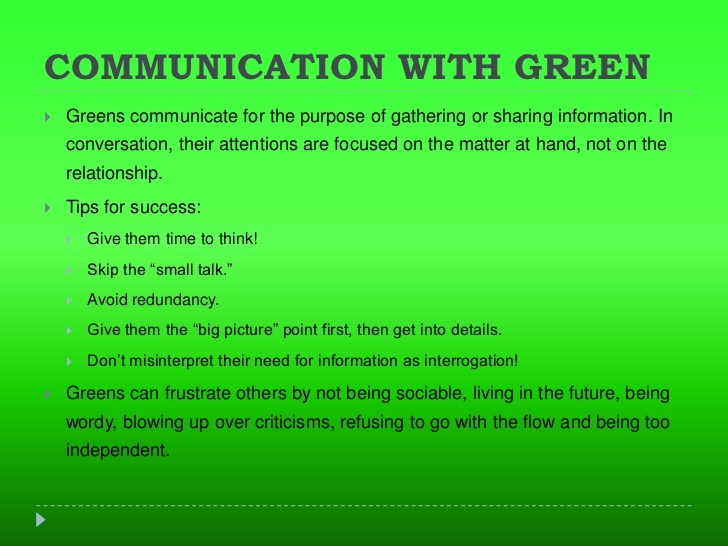 On the bad side, green can represent people who are too materialists and in need to own a lot. Hi Kendra, the author is Dena P – writer for ColorPsychology.org. 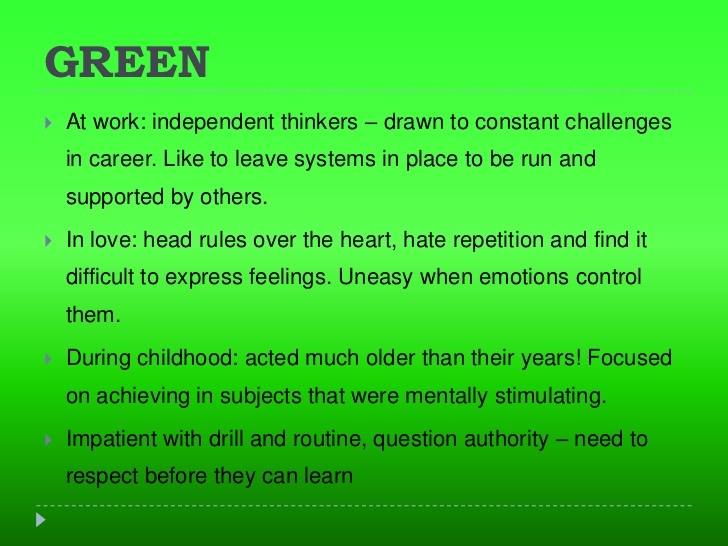 I like this article, my favorite color is green and I can see some of my traits reflected in here. How would it be interpreted if my first favorite color would be green,the second white and the third light pink? Im going out with a friend & was told to wear something green & visible, why is this? I was really astounded too by its truth. 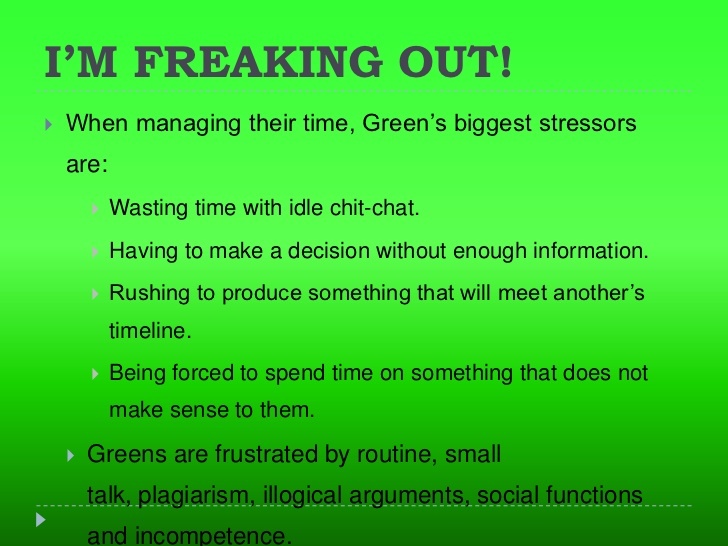 Green must be the colour of the introvert as so many link. Almost to a T! My second favorite color is yellow. 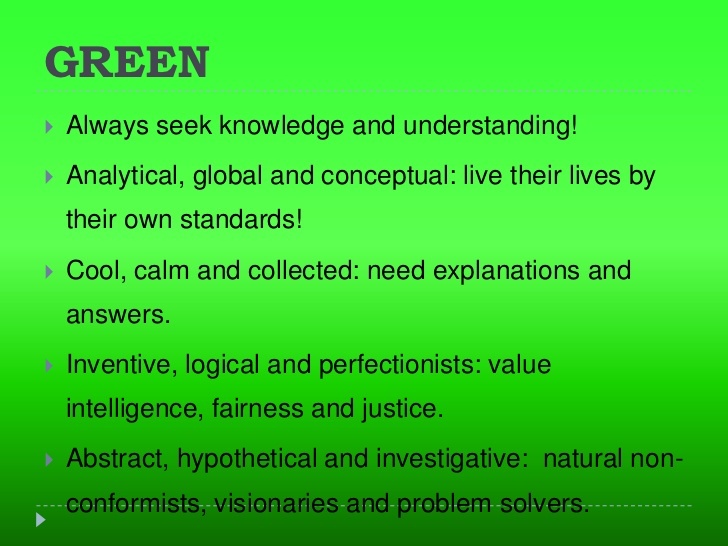 I always liked GREEN not knowing the above mentioned characteristics . this is completely near to my behaviors and intentions, thanks so much. 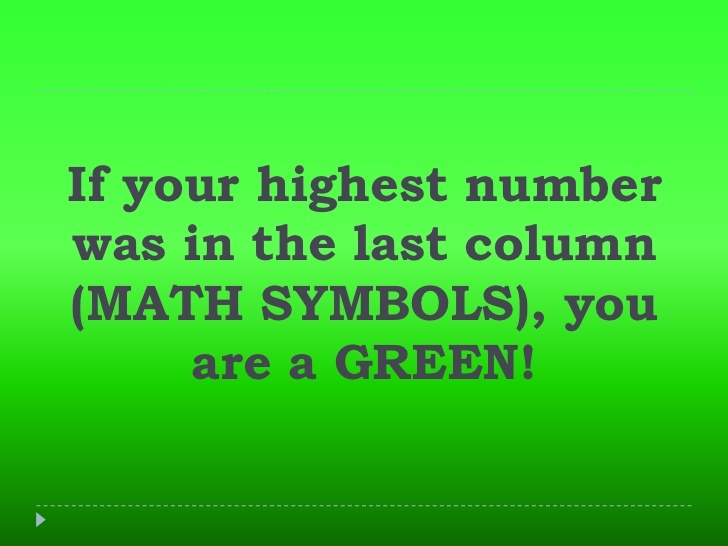 So this is my truth, I love green. Didn’t really realize just how much until someone identified that almost every room in my house is some shade of green. It’s my foto color but I don’t wear it? What’s that about! This is me competely, and I love green. It may just be a few bits here and there, a beautiful duvet cover, throw cushions, and intriguing silk plant with ferns, but green turns up in all the rooms along with grey. And I love to wear green as I have red tones in my hair. As I understand it I am a 15 to 16 green and a 10 to 12 gold. Orange and blue are 3 to 4. The number scale is 1 to 18.